Global leader in full-service visual documentation announces seamless integration with the leading provider of cloud-based construction software. With this integration we are providing direct access to critical information that will allow Procore users to deliver quality projects, safely, on-time, and within budget. 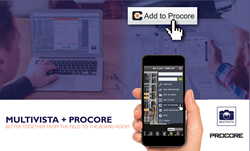 Multivista, a leading global provider of documentation and software services for the construction industry, announces today a partnership with Procore, a leading provider of cloud-based apps for construction. Through an advanced integration, users of both services can immediately attach and reference Multivista-captured visual data to perform critical project functions within Procore. Procore Technologies, Inc. is a leading provider of cloud-based applications for Construction. Through Procore Construction OS, the company connects people, applications, and devices through a unified platform to help construction firms manage risk and build quality projects, safely, on time, and within budget. The company has a diversified business model with products for Construction Project Management, Construction Financials, and Quality & Safety. Procore has more than 2 million users managing billions of dollars in annual construction volume. Headquartered in Carpinteria, California, Procore has over 700 employees in offices across the globe. For more information about Procore, visit http://www.procore.com. Multivista has been contracted on over 2.5 billion square feet of construction projects worldwide, and is trusted by the industry’s leading companies to mitigate risk, create efficiencies, and deliver a high level of project insight throughout a building’s lifecycle. The company offers a full suite of visual construction documentation services on an intuitive cloud-based web platform, and has local boots-on-the-ground support in over 75 international markets. Multivista was named a 2017 Top Global Franchise by Entrepreneur Magazine, and has been honored as an innovative and technological leader by Constructech for four consecutive years. Multivista is part of Hexagon (Nasdaq Stockholm: HEXA B; hexagon.com), a leading global provider of information technology solutions that drive productivity and quality across geospatial and industrial landscapes. For more information about Multivista, visit http://www.multivista.com.